Huawei may beat Samsung to market with a hole-in-display phone next month, but Samsung would still be ahead of the pack with exclusivity over pierced flexible OLED screens, reports Korean media. The company calls this Infinity-O display and may debut it with the member of its midrange A-series next month, but on an LCD panel which is cheaper to produce. It is harder to drill a hole in a screen and have everything around it showing an image, it turns out, than having a top bezel protrusion, aka "notch," at least from an engineering perspective. The hole where the front camera will go needs to be drilled precisely with lasers, and Samsung found a way to use its existing laser equipment to outfit the current OLED conveyor belts instead of wreaking havoc on the production flow by installing new machines. It has also allegedly mastered the deposition of the organic material around the hole area and paid special attention to the gap between the are that will be pierced with the laser, and the bezel, in order to keep it fully operational. The Hole in Active Area (HIAA) process has been developed for Samsung's flexible OLED lines which would give it a year or two advantage before the competition, as it is the only maker with rich experience in producing curved, flexible OLEDs. Other OLED panel manufacturers don't have the ability to produce enough quality yield of such displays (just look at the LG's green tint issues on some Mate 20 Pro screens) so they might be forced to apply the hole-in-display technology on rigid OLEDs or LCDs which aren't very suitable for drilling. 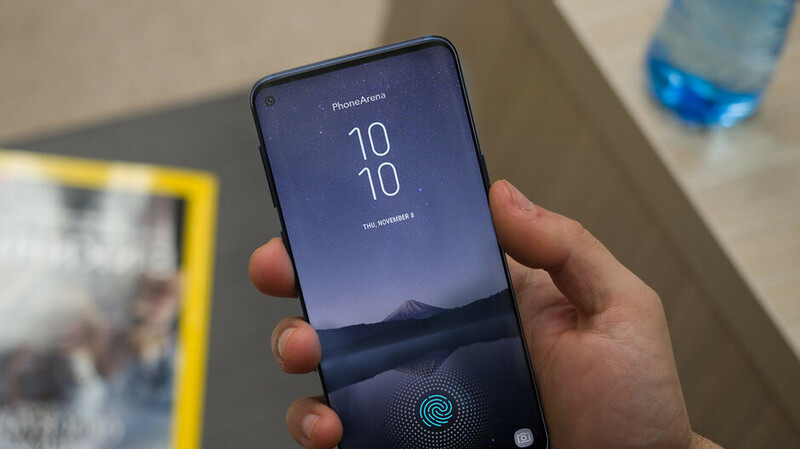 Thus, while the Galaxy A8s or whatever hole-some display Huawei comes up with, are still expected to use BOE-made LCD or OLED screens, the Galaxy S10 models would utilize Samsung's exclusive HIAA tech for flexible OLEDs. The company has reportedly already started mass production of the pierced A8s panels, so we'd expect an announcement pretty soon, as a harbinger of what's to come with the S10. It's hilarious how companies fight so much over reducing the top bezel, but the bottom chin sticks out like a sore thumb and no one besides Apple could eliminate it. From a design perspective, the bottom chin removal is just as important as the top bezel. Only apple? You love your fruit don't you? I own a OnePlus 6 and an S7 Edge :) But we have to give credit where it is due. All Android manufactures have been caught with their pants down regarding chin removal, no one has a clue how to do it without breaking Apple's patents. Apple uses a Samsung screen. Samsung did it, not Apple. LOL , yep Got to give credit where credit is due. Good thing Samsung made those screens for apple since no one else can. Apple didnt eliminate the bottom chin. All iphones still have it. They just blend into the equally thick side and top bezels before getting to the notch. The resulting uniformity gives the illusion of no chin. it looks better that way. The title of this article should be " Samsung started mass production of putting a hole in the display panel ". LOL. This new "dead pixel" feature annoys me. First curved screens, next notches and now holes...please offer plain flat screens again. This is a perfect example of my above comment. Yeah second the flat screens. Hate the horrid curved stuff. There's alot of options out there that you can choose from you know. If it bothers you you buy something else simple. Looking forward to this, hopefully it has always listening Google Assistant, miss the always listening Siri so much since I switched back to Android. Why don't all Android mid range and higher phones have this? One of the biggest draws of the Pixel line is the always listening perk. This really wets my appetite for the Note 10, that S10 render is plain sick. Samsung is about to bring the noise big time in 2019, gotta have a Note 10. Note10 will compliment my note8 and note9. I have own every note since its inception. I've owned all, except the Note 1. Best phone every year.